Judge Table Essentials have 21 new pieces that will complement any tableware collection. The Judge Table Essentials range are designed to suit every family’s lifestyle and is a collection that offers the flexibility that is required by todays varied households when choosing their dinner service. Whether you are looking for a range for everyday or for formal dining, or whether you have a large or small household, you will be able to find the perfect tableware from the Judge Table Essentials range. This wonderful range has over 100 items in the collection with 21 new pieces in the range. The wonderful feature about this range is that these pieces are classic and stylish and will stand the tests of time. They are all made from porcelain which means every item is suitable for the oven, microwave, freezer and dishwasher. Each piece is a pure white colour so they will complement any other tableware you have. Each item is also available to buy individually so you can buy as many pieces as you need and top up as and when you need. I have used the Judge Table Essentials Skillet and I absolutely love it. You can use this skillet to cook a variety of meals on the hob and in the oven. I used it to cook a frittata and it cooked it wonderfully and evenly. It was also very easy to clean afterwards and is conveniently dishwasher safe. It can also be used in the microwave and freezer. 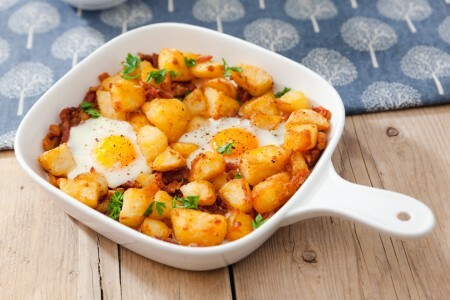 The crisp white design of the skillet is fabulous and will compliment any kitchen. The skillet is 21cm and the RRP is £19.00. Another wonderful piece from the Judge Table Essentials range is the Jug. 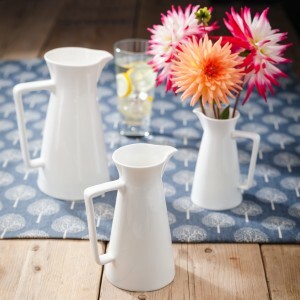 I have used the 600ml jug and it is ideal for serving water and soft drinks to guests when entertaining. I also used it to serve cream in to accompany an apple tart I made! The elegant design of this mug is ideal for entertaining and can also be used as a vase for a colourful bouquet of flowers. The jug is oven and microwave safe, fridge and freezer safe and dishwasher safe so is convenient to have in the kitchen. The jug is available in three sizes; 350ml, 600ml and 1l. The RRP starts from £7.00.